If you're an American, you can expect passenger rail service to be a disappointment. But in the New York area, disappointment has mutated into disgust. 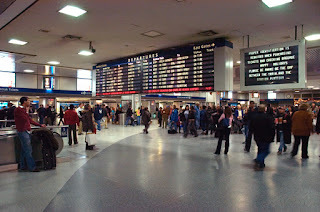 New York Pennsylvania Station, North America's busiest railway station, is undergoing significant delays thanks to equally significant repairs needed for the tracks. It seems that the neglect of the station's rail infrastructure is responsible for more than a few derailments of Amtrak, NJ Transit and Long Island Railroad trains in recent months, and the station itself is so mismanaged by Amtrak that, in rare bipartisan fashion, Democratic New York governor Andrew Cuomo and Republican New Jersey governor Chris Christie are ticked off with the whole damn thing. Not that they've done anything in recent years to make things any better. Trains at the station have been increasingly late for years, thanks to failing systems and aging tunnels under the Hudson River that need to be supplemented by new ones. On top of all that, the station itself is crowded, cramped, fetid and dilapidated, its grand old waiting room long since torn down and replaced with a sports arena that looks like a giant carburetor filter. 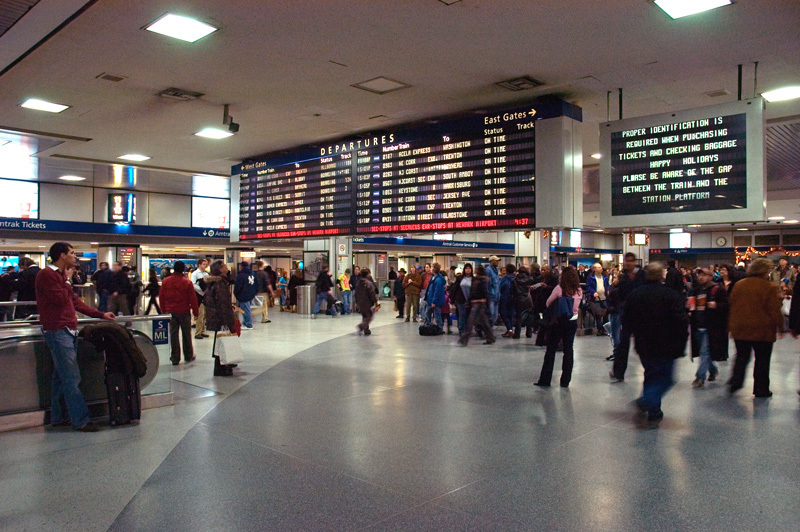 Plans to build a new, modern station named for the late U.S. Senator Daniel Patrick Moynihan, Democrat of New York and a friend of mass transit, have been just that - plans, never enacted upon. Amtrak also has to deal with replacing decrepit bridges nearby, including a swing bridge in New Jersey over the Hacksenack River that was built when Roosevelt was President - Theodore Roosevelt - which constantly fails. And there's the Metropolitan Transit Authority rapid transit system of subways and elevated trains. I've ridden the MTA constantly whenever I've been in New York, and I've seen the system rebuilt and refurbished over the years. The trains are cleaner, the stations are decent, the porcelain walls of the station have had art work added to them, such as a Roy Lichtenstein mural in the Times Square station, and the trains run frequently and at a good clip. And it's all a mirage. The system has been using equipment that was installed when Johnson was President (Lyndon, not Andrew - the system isn't that old! ), its tracks are aging, and expansion of the system has been slow at best - good grief, it took forever just to open a portion of the new Second Avenue line! The MTA, however, is in a state of crisis and needs a billion-dollar baby of a bailout. Trains on the F and G lines have derailed in recent years, and an A train derailed in Harlem just last week. If Billy Strayhorn were alive today, he'd write a song urging folks bound for Harlem to walk. Simply put, a new 7 train terminal near the Javits Convention Center and some festive murals in the Times Square station have not made New York subways the equivalent of the Paris Metro. It's going to get worse before it gets even worse. Even if Donald Trump's trillion-dollar infrastructure program somehow passes - and Mitch McConnell shows no interest in pursuing it - Trump hasn't mentioned anything about regional mass transit, not even in regard to his hometown of New York City. His proposal to discontinue long-distance Amtrak routes to shore up the Northeast Corridor will likely, as I've already opined, reduce what little support there is for Amtrak outside the Northeast. High-speed trains? Nah, the federal government is too busy planing another Interstate highway through Nevada and Arizona to care about anything like that! The United States remains an autocentric country at heart, and I don't see our attitudes toward public transit changing any time soon. Trump won't talk about public transit, Hillary Clinton didn't talk about it, and the only 2016 presidential candidate who did talk about it got only 0.6 percent of the vote in the Iowa Democratic caucuses. The regional public transit system in the greater New York area may be ready for badly needed improvements, but, ready or not, it ain't getting any.